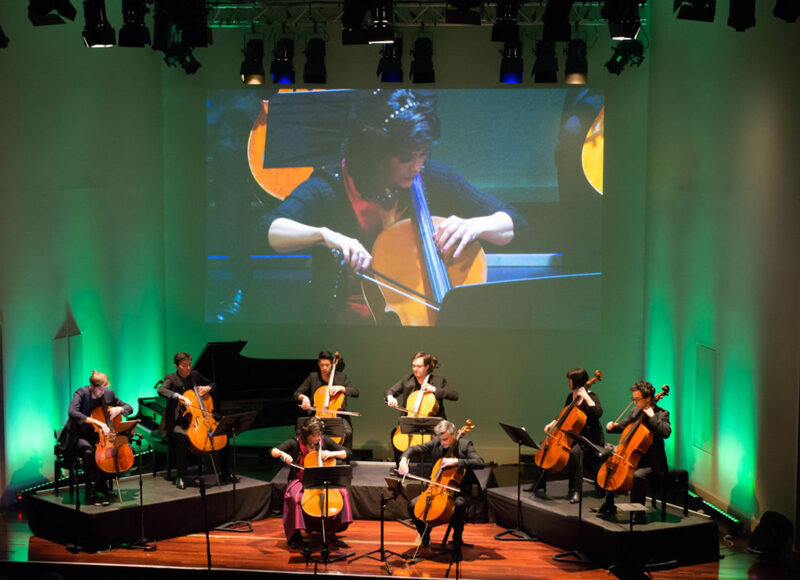 Cellists Aotearoa is a multimedia concert production of music by New Zealand composers for cello and cello ensemble. 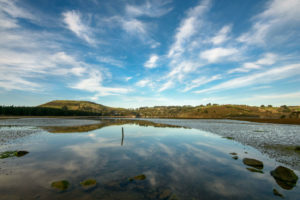 Combined with projected videos of performers, New Zealand landscape photography and poem extracts, Heleen du Plessis aimed at convening and curating a multi-sensory experience – A Sound Sensation! In her role of researcher, producer, organiser, project manager, musical director and soloist, she brings the many facets of the production together. With its fusion of artistic elements, Cellists Aotearoa is inspired by social theories of landscape and music as markers and reinforcers of identity. Because landscapes are part of a country’s national heritage and have symbolic importance, the interplay of place and music plays significant roles in defining who we are. Our common identity is bound together through shared history and attachment to homeland, yet, Cellists Aotearoa goes one step further. Globalisation has brought about philosophies about multiple belonging, replacing the concept of belonging to a single nation. 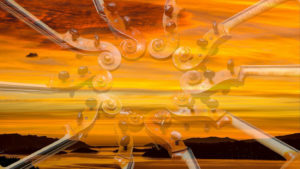 Where Cello for Africa was symbolic of reconciling the desire to connect to her roots with the feeling of being dislocated and uprooted, Cellists Aotearoa is symbolic of putting down roots and furthering the journey to finding a sense of belonging. The works Heleen commissioned included ‘Purakanui’ by Anthony Ritchie, ‘Doubtful Sound’ by Trevor Coleman and ‘Turangawaewae’ by Corwin Newall. They were based on and presented in conjunction with the landscape photography of Pieter du Plessis. When Pieter and Heleen arrived in New Zealand in 2010, Pieter embarked on a new career and, inspired by the beauty of the region, became a landscape photographer. ‘Turangawaewae’ by Corwin Newall, means ‘home’ or ‘a place to stand’ and was combined with photos of the breathtaking view of the Otago Peninsula, taken literally from the du Plessis kitchen. Cello performance at its absolute best – a highlight of Arts Festival Dunedin … An extraordinary ensemble and extraordinary selection of works, flanked with glorious landscape photography by Pieter du Plessis… With its extraordinary scope and quality of both compositions and performance, Cellists Aotearoa created a musical experience that was ‘A Sound Sensation’ indeed. Bravo! 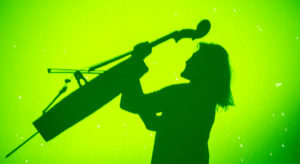 Supported by a Creative New Zealand Arts Grant and crowd-funding, Heleen’s latest commission and performance project, Tahu-nui-ā-Rangi for cello and marimba by Gareth Farr, builds upon the concept of multiple belonging, to ultimately being part of an infinite connection to the universe and members of one human family. 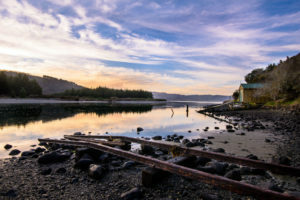 Doubtful Sound or Patea means a place of silence. The vast and untouched wilderness in the far south west of New Zealand is the second largest fiord in the Fiordland National Park. Known for its rugged peaks, lush rainforest, hidden inlets, tree avalanches and magical waterfall veils, it is a significant marker of landscape and New Zealand’s most famous tourism destination. Here, where two worlds collide to form the Alpine Fault line, the Indo-Australian plate plunges beneath the Pacific plate, creating the Southern Alpes that in return forms the backbone of the South Island. Unique to the area are the shapes and shades of the mountains, the curves and symmetry of the lines, the reflection in the water. There are two layers of water. The fresh water from the water falls in the mountain containing stains from the roots of the trees and the seawater. The two do not mix. It causes the top layer to be black and influence the deep-sea species to live much closer to the surface. Heleen wanted the shapes and shades of the contours to be painted in sound, with musical phrases imitating the lines and echoes mimicking the reflection in the water, the improvising saxophone and trumpet above the cello ensemble to represent these layers. 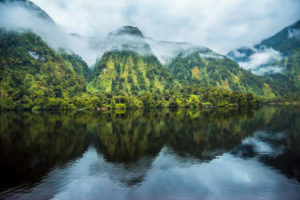 In 1793, a Spanish expedition led by Alessandro Malaspina visited Doubtful Sound to conduct experiments using a pendulum to measure the force of gravity there, being the mid-point between the Equator and South Pole, confirming that the figure of the earth was not symmetrical. 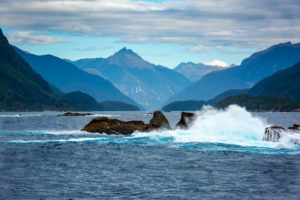 They were the first Europeans to enter and map Doubtful Sound and proclaim the only Spanish place names found in New Zealand: Febrero Point, Bauza Island, Nee Islets, Pendulo Reach and Malaspina Reach. “When Heleen asked me to compose ‘Doubtful Sound’, I imagined the first impressions these early explorers may have experienced – initially, the wondrous, almost overwhelming ‘Majesty’ (movement I) of the mountains and their overlapping contours underscored by a deafening silence. Eventually one would undoubtedly ponder the ‘Mystery’ suggested by the low-lying clouds and beckoning cavities (movement II). Over time, such a sound of Eden would accumulate ‘Memory’ (movement III): the birds inherit history in their song, and the explorers also infuse their biographies and cultures. In my own way, I consider myself an explorer. Every year I travel somewhere previously unknown to me, confronting myself in the face of unpredictability. More often however, I travel within the comfort of my home studio, where I create and confront challenges through the unpredictability of composition, ideally exploring unknown musical territory”. to shelter birds with silent tongues and wings of bark. “On the slopes of the “island” long green grass sways in the sea breeze, while the leaves of the numerous cabbage trees rustle continually as if mournfully trying to tell the story that exists beneath their roots. 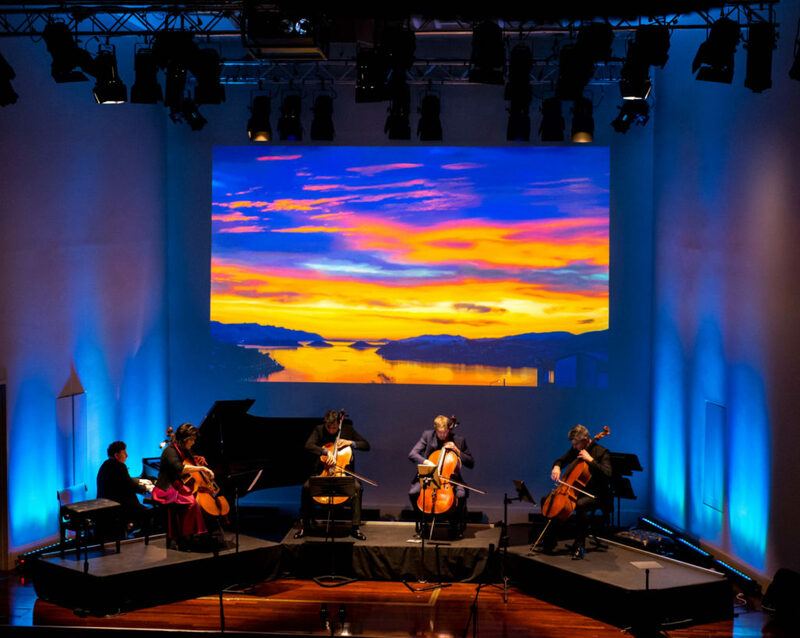 Memories of Purakaunui was commissioned for the project Cellists Aotearoa for Heleen (lead cello), along with cellists Andrew Joyce, Ken Ichinose, Ashley Brown and Peter Lee and pianist, Terence Dennis. The single movement work was also written with the prospect of creating a version for solo cello and orchestra in mind. 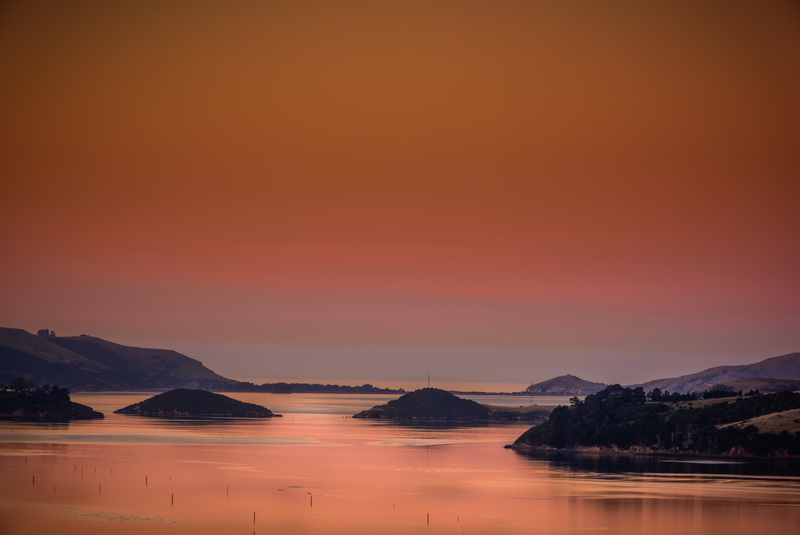 ‘Some years ago my wife and I bought a holiday house in a small seaside village called Purakaunui, near Dunedin. 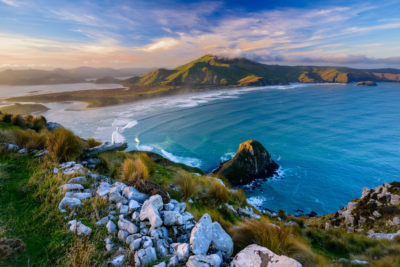 This is a beautiful and peaceful area of New Zealand, with bush, birds, and beaches, and has been an inspiration for my composing. Memories of Purakaunui reflects on aspects of Nature, with sunlight glinting on the still inlet at the beginning, and depictions of birdcalls and turbulent winds. However, the music also reflects on human interaction with the environment. Adults and children play in and around the sea, as represented by a vigorous theme at in the quick section, and further there are rowing of boats. These activities have been part of the fabric of Purakaunui for many years. Going even further back into human memory, there are sadder, even tragic events that are part of the history. 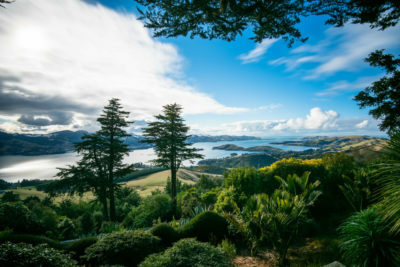 Intertribal warfare centuries ago led to a massacre on the beach near Purakaunui, and more recently Maori lands were taken by European settlers with little regard for the Treaty of Waitangi, or natural justice. Purakaunui was stripped of its bush, which has now grown back. Although many years ago, these events still resonate at Purakaunui today. They inform the musical ideas in the slow sections of music, which feature long, expressive cello melodies’. Written for the newly formed Duo Col Legno, with marimba virtuoso Yoshiko Tsuruta and Heleen du Plessis, the composition is the first ever work for marimba and cello in New Zealand. 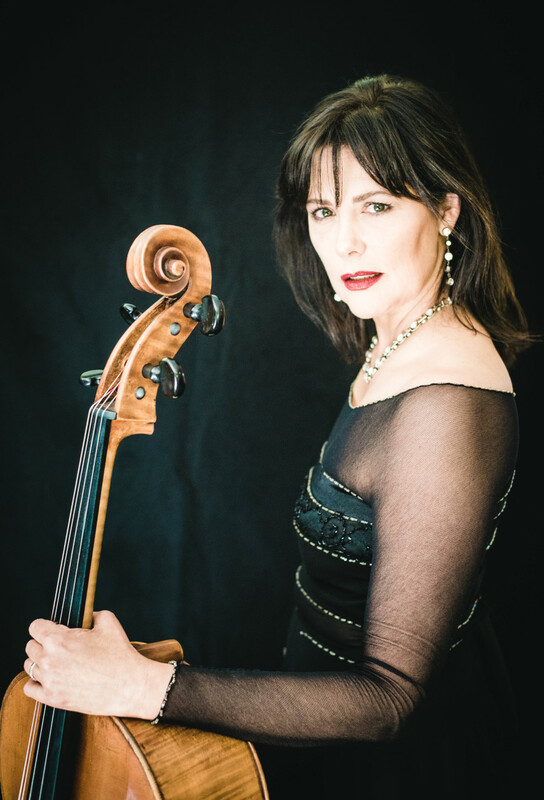 It stems from Heleen’s acclaimed concert and CD projects Cello for Africa and Cellists Aotearoa. The commissioning, performing and recording of new music in these projects investigated the role of music in strengthening roots, connecting to place and finding a ‘sense of place’. Tahu-nui-ā-Rangi is the Maori word for the Aurora Australis, visible from the southernmost parts of New Zealand, and incorporates some Maori views of the aurorae being ancestors’ campfires reflected in the sky, emphasising universal belonging and spiritual connection. It builds upon belonging to a single nation to multiple belonging, to ultimately being part of an infinite connection to the universe and members of one human family. The world premiere will take place in Dunedin’s Planetarium of the Otago Museum on 4 May 2019 where, combined with atmospheric lights and colourful electric dancing veils of the Aoroa Australis, it will transport the audience to a world of light and sound. 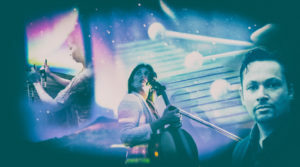 The cello-marimba sound blend ranges from ethereal to pounding and percussive, as Farr brilliantly makes use of extensive techniques in both the cello and marimba part to reflect not only the visual effects of the magical phenomenon, but also the sounds it makes. Dr. Ian Griffen, Aurora Australis expert, and a representative of Otago Museum will provide enlightenment on, respectively, the scientific and cultural aspects, completing a multi-sensory experience that draws together music, philosophy, culture, art and science. With the commissioning, supported by a Creative New Zealand Arts grant and crowd-funding, the longer-term vision is to expand it into a large-scale work of several movements. It will form part of Duo Col Legno’s Chamber Music New Zealand Tour in May 2019. See tour programme here CMNZ.